Product information "Striped Grenadine / Garza Grossa Silk Tie - Navy / Burgundy / Yellow"
Stripes really enhance the appeal of a grenadine tie, elevating the textural richness of the tie. Something that true connoisseurs will appreciate. Goes well with our grey polo shirt, ukio-e printed pocket square, and navy barathea braces. Grenadine ties are among our absolute favorites. There are only two weaving mills left in the world which can produce the original; both produce for Shibumi. The old looms on which this wonderful cloth is woven are often still made from wood and are carefully kept in shape by experienced technicians, for no new ones are made. 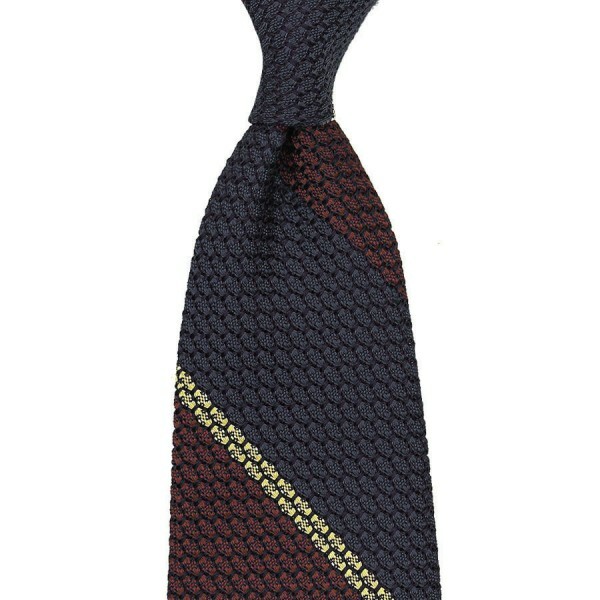 Related links to "Striped Grenadine / Garza Grossa Silk Tie - Navy / Burgundy / Yellow"